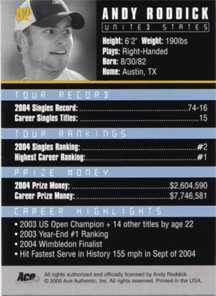 The 2005 Ace Authentic Debut Edition tennis trading card factory set, produced by Ace Authentic of Tampa, Florida, arrived on the market in January offering the first officially licensed tennis cards since the 2003 NetPro products. Building on previous tennis card products, the new cards from Ace have a nearly identical design to the NetPro Premier Edition set. Cards in the Debut Edition set feature a standard front design that integrates the player's name, country name and country flag over a full-bleed, color action shot. 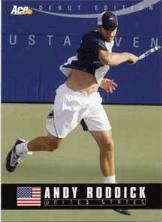 The card backs follow a standard design of player vitals; career statistics including tour record, rankings and prize money; career highlights; and the card numbers. The back also includes a small black-and-white headshot of each player. According to Ace, the Debut Edition set will be their only product featuring a relatively basic design. Future products will have a look and feel similar to an Upper Deck SP Authentic or high-end Donruss/Playoff brand. Coupled with the fact that the company has obtained a multi-year agreement with players, expect to see exciting products moving forward. 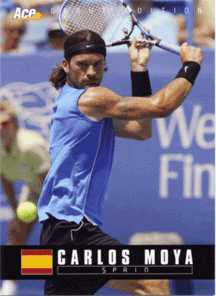 For its part, the Debut Edition set contains the first officially licensed rookie cards of many of today's international tennis stars including Maria Sharapova, Justine Henin-Hardenne, Tim Henman, Carlos Moya, David Nalbandian, Nadia Petrova, Dinara Safina, Tatiana Golovin and Marat Safin. 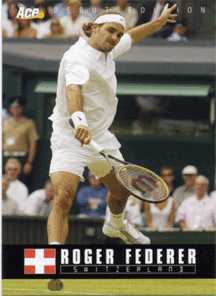 The set also includes cards of superstars and fan favorites such as Andy Roddick, Andre Agassi, Juan Carlos Ferrero, Paradorn Srichaphan and Roger Federer. The 98-card factory set (97 player cards and 1 checklist) has a limited production run of only 10,000 sets (1000 cases of 10 sets). Each set also includes one gold-embossed (foiled) parallel card serially numbered to 100 with only 100 total parallel sets produced. According to Ace, they produced some promotional sets - including the one we reviewed - without the gold card. Also randomly inserted is a redemption card for the first autographed Maria Sharapova rookie card - serially numbered to only 100 cards. With a brand-new product, it's not uncommon to find a few minor issues with the design or packaging. For example, the checklist card lists the players in alphabetical order along with their card number rather than in traditional numerical order. Also, the location of the card number on the back of three cards was moved rather than cropping the headshot differently. In addition, the product packaging incorrectly states that the set includes a card of Anna Kournikova. More importantly though, the overall quality of the set (see notes below) was consistent with what is typically seen in today's trading card products. 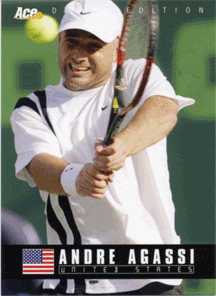 The 2005 Ace Authentic Debut Edition tennis trading card factory set is only $19.99 (plus shipping and handling) and is available directly at AceAuthentic.com or through various online stores. 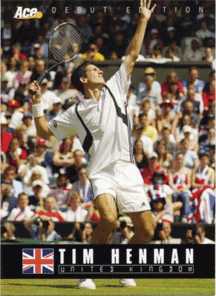 At this very reasonable price, Ace provides a quality product for collecting 2005 tennis cards, including the key new rookies. If you're lucky enough to pull one of the autographed Sharapova rookie cards, the low price quickly becomes a major bargain. If you're still not sure whether to purchase a set, you might want to request the free, limited-edition Sharapova rookie card that Ace is giving away (offer expires 12/31/2005) to help promote their new trading cards. To request your copy, click here. For those that purchase the set, you can complete and return the special offer card included in the set to get a free copy of TennisLife magazine in addition to your Sharapova rookie card. Quality notes: 21 cards (21.4 percent) had an issue with minor surface flaws such as faint indentation lines or spots or small ink-spot variations. These surface flaws were seen on both the fronts and backs of the cards. In addition, a number of the cards (including the Sharapova card) showed very minor corner bending - primarily on the upper left corner. While these small flaws did not take away from the overall look and feel of the set, you should look for these issues on any of your key cards. Bob Williams is the President and CEO of Trading Card Central, a company he founded in 2000. Trading Card Central covers sports cards, non-sports cards and collectibles and features the latest industry news, articles, product reviews, forums, giveaways and a growing number of collector resources. Bob has been collecting sports, non-sports and gaming cards for over 20 years and has a personal collection of over 0.5 million items.